There are many things that can determine your chance of landing your dream job. These may include high grades, an outstanding CV, or the ability to ‘sell yourself’ during group and individual interviews. In addition, you will be assessed with many different types of psychometric testing – numerical tests, verbal reasoning tests, and personality tests, to name just a few. These psychometrics tests are becoming more and more popular among Australian test recruiters. About 180,000 Australian students are about to graduate and enter the job market. That’s why you need to prepare yourself as early as possible—so you can get an edge on the long and challenging path to secure the job you want. In fact, psychometric tests can be practised. Also, if you apply effective tips when taking these tests, your results will be better. In this article, we’ll outline information about psychometric tests from Revelian, a popular test provider in Australia, and tips on how to do your best on these tests. If you are about to take such a test, it is time to gain these pieces of useful information. The Revelian tests are developed by the Revelian company, whose mission is to ‘provide innovative, cloud-based HR tools to inform effective people decisions.’. The company was founded 15 years ago in Australia with the previous name of Onetest. Revelian is now a well-established and prestigious psychometrics company. Each year, the company provides assessments for many big companies, testing around 200,000 people in Australia and around the world. 2) What Are Revelian Cognitive Ability Tests? The Revelian Cognitive Ability Test (RCAT) includes 51 questions in total. Like most of the other tests, it is timed. You have 20 minutes to answer all the questions. Verbal Questions: These questions assess your ability to understand and interpret written texts. You must possess basic English language skills to select one correct answer. Based on how well you do on these questions, the recruiters evaluate how well you’ll understand the written information you have to deal with in your job. 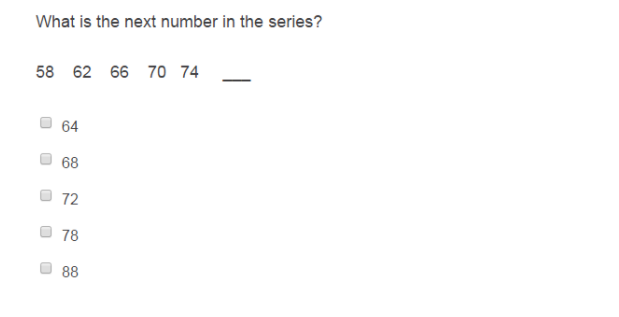 Numerical Questions: These questions assess your ability to work with numbers in different contexts. You don’t need complicated math skills, but you must possess an understanding of the four main functions: adding, subtracting, multiplying and dividing. They can be shown in number form or sentence form, as well as Sodoku type. Abstract Reasoning Questions: These kinds of questions test your ability to think logically. For example, you need to identify a pattern of a string of different shapes and find the odd one or the missing one. These questions come in different levels of difficulty to help recruiters to classify the different abilities of their candidates. The questions at the end of each test are more difficult than the questions at the beginning. The RCAT is widely used, not only when you apply for a graduate entry jobs, but for all kinds of jobs of different levels of experience. In most recruitment processes, this test is administered after the CV screening round and before the assessment centre and individual interviews. The Numerical Reasoning Test consists of 25 questions which you need to complete in 12 minutes. The test evaluates your numeral ability as well as your ability to understand numerical concepts and how you interpret them. Some common types of questions include calculating an equation, finding the pattern to rule one out, or completing the missing number. You also need to interpret data from a chart as well. The Verbal Reasoning test consists of 35 questions which you need to complete in 10 minutes. The test aims to assess your comprehension ability as well as your communication skills. During this test, you are presented with several passages. You then need to answer questions based on the information provided in the text. In addition, you may encounter questions in which you are asked to rule out the word that doesn’t belong to a certain list. The Abstract Reasoning test consists of 32 questions which you need to complete in 10 minutes. You must possess the ability to make logical decisions based on abstract information to complete this test successfully. In this test, you are often asked to complete a visual sequence, find the connections between the images, or find the one that doesn’t belong to the set. Revelian has designed multiple sets of personality tests to assess potential candidates’ behaviours and characteristics. There are two main types of tests (see below) and both are untimed. The Behavioural Profile: There are 24 questions in the test. 16 Personality Factors Questionnaire: There are 170 questions in the test. Revelian offers two games—Cognify and Theme Park Hero—to test the applicants’ cognitive ability with an engaging gaming experience. Cognify: Candidates play seven different short games in around 20 minutes. Theme Park Hero: Candidates play the park manager performing various tasks within 10 minutes. This game serves as a test against the player’s mental agility and attention, as well as other abilities that a traditional test cannot assess. 7) Which Australian Companies Use Revelian Tests? Here is a list of some Australian companies who are currently using Revelian tests in their recruitment processes. As Revelian is one of the most well-established test providers in Australia, this list is impressive. Telstra: The biggest telecommunication company in Australia uses the Revelian cognitive ability test and the personality questionnaire. Westpac Group (including Westpac Bank, BankSA, St. George Bank, Bank of Melbourne, RAMS and BT Financial Group): The banking and financial group uses Revelian cognitive ability tests, the personality questionnaire, and the Revelian Theme Park Hero test. AMP: This company uses the Revelian Theme Park Hero game test. Honeywell: This company uses the Revelian tests for its graduate recruitment programs. Australian Government: Revelian tests are used for its graduate program or for anyone who applies for a service officer position. Deloitte: If you are applying for the position of finance manager or advisor, be prepared to take the Revelian cognitive tests. New South Wales Government: The organisation uses Revelian tests for potential candidates applying for positions such as firefighter, police officer, and paramedic. APRA: Revelian cognitive tests are used by the company to test potential analysts, managers, and newly graduated employers. Other companies that use Revelian tests are: Chevron, BMW (Australia), Energy Australia, BDO, PDB Advisory, Woodside, Technip, Toga Hospitality, Medina Hotels, Thiess, ARUP, Equip Super, Pegasus Employment, Suncorp, AMP, Peabody Energy, AURIZON (Queensland Rail), Dun & Bradstreet, and PepsiCo. Some governmental organisations that use Revelian tests are the Department of Immigration and Citizenship, the Department of Defence, and the Department of Health. It is worth noting that most of the big companies on this list also use other test providers from time to time. Therefore, it is worth looking on the company’s website at the time you apply for more updated information. Find examples of Revelian–style tests on the Internet and start practising Completing several Revelian practice tests before the real test will help you be more familiar with the format and structure of the tests. Practising frequently also helps you to answer the questions much more quickly. Make sure you take practice tests under similar conditions to the real test, i.e. timed tests with no distractions. If you are an international student seeking a job in Australia, it is time for you to read and increase your English vocabulary. You will need decent English skills to understand most of the verbal reasoning questions. If your vocabulary is limited, you might have difficulty in understanding the questions, thus reducing your speed in answering them. You should, therefore, enrich your industry-specific vocabularies as well as learn a broader range of words. The day before you do the test, make sure you sleep well. Your brain will only be at its best condition and peak alertness when it rests well. Pack everything you need the night before your test, such as pen, pencil, rubber, calculator, and a bottle of water. Before you start answering the questions on the Revelian tests, you should read all the instructions carefully and make sure you fully understand what you need to do. With limited time and a lot of questions to complete, you usually have less than a minute to answer each question. The key here is to stay focused without being too stressed. Take a few deep breaths when you think you are worrying too much. Don’t spend too much time on a single question. If you don’t understand the question or can’t find the right answer, don’t panic. Just skip that one. For the Revelian personality test, just be yourself and tick the answers that suit your personality the most. If you fake the answers to ones you think the recruiters are looking for, you might get the job. However, you may end up with a job that doesn’t really suit your preferences. Later, when you are unhappy with what you are doing, you will not be able to succeed. Manage your time well. According to Revelian, just 2% of its test takers finish all the questions. If you manage to have some time left at the end, check your answers. Finally, believe in yourself and try your best. Success will come to anyone who prepares and has enough faith in his or her ability. Make sure you are prepared for your upcoming Revelian test! Check out this comprehensive preparation package for the Revelian Cognitive Ability Test. It includes four full-length practice tests, extra verbal and numerical practice, and video tutorials. All practice materials simulate the format and time frame of the real test.